Insmere is a beautiful in-town home with great views of the harbor and off-street parking. The home is very tastefully decorated and nicely equipped to accommodate travelers. Enjoy being in Stonington’s quaint and scenic village where you are just a short stroll to The Opera House for an evening performance or to Aragosta for a farm to table dinner. The views from the home are quite lovely and can be enjoyed from many areas of the home. Insmere has four bedrooms and two baths. The kitchen is large and very nicely equipped to provide service for the seven people Insmere can accommodate. The kitchen opens to the dining area which has seating for six people. There is a living room with a comfortable couch and arm chair. The home has satellite television for those that enjoy evening or daily programming. Insmere has two first floor bedrooms. The first bedroom has a queen bed, a dresser, and a closet. The second bedroom has two twin beds, a closet, and dresser. In between these two bedrooms is a full bathroom with a shower/tub combo. The second floor of Insmere is very tastefully remodeled, with gabled dormers and nice views of Stonington’s beautiful thoroughfare from each second floor bedroom. The first bedroom has a full bed and a sitting area. The second bedroom has a twin bed, a desk, and a dresser. Insmere has a lovely wrap-around deck which also takes in the sights of the harbor. There is a tarred drive providing parking for two to three vehicles. There is also a small grassy knoll where one could sit and read a book or harbor watch. Insmere is a perfect in-town retreat. 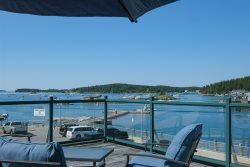 Reserve some time in this Stonington accommodation today. can't beat the location and the view clean, comfortable would rent there again in a heartbeat. Only two criticisms the driveway was too steep, we scraped the boat hitch. Use the space along the road. the wifi internet is very slow and we could only get phone reception updtairs and that was spotty. Otherwise a wonderful place.